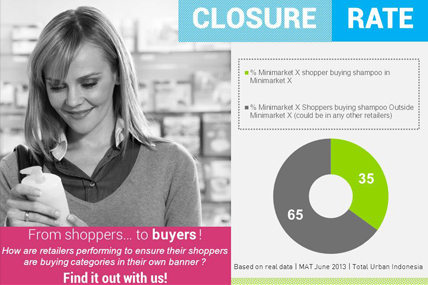 The Closure Rate helps you unerstand retailers performances from a category or brand point of view. How are retailers performing to ensure their shoppers are buying categories or brands in their own banner? Consumer panel is an incredibly rich tool and should not be limited to brand strategy and marketing tactics ! We are also able to deliver actionable insights and deep focus on retail and shopper dynamics. One of our greatest measure to help you understand retailers performances from a category or brand point of view is the CLOSURE RATE. The purpose of this tool is to measure how good is a retailer at converting shoppers into buyers. In other words, when shoppers enter a store, will they purchase your category in that store or will they prefer to wait for their next visit to another retailer ? This information is unique to consumer panel and both valuable for manufacturers and retailers… raising many other issues we can help you with : when shoppers are not purchasing a category in that store, where else do they purchase it? What is their profile? Why are they preferring a banner to another in this category? …and if you find your mind being tickled, we are just a phone call or an email away.